A natural gas crater in Derweze, Turkmenistan continues issued fire since 1971. Due to its creepy appearance , then the crater dubbed as the 'Doors to Hell'. The Soviet Union engineers who was first discovered the area in 1971. Initially, they thought have found oil wells. But while digging, the ground suddenly collapsed, creating a crater with a diameter of 69 meters and a depth of 30 meters! Then these massive crater began releasing methane, a natural gas which is highly flammable. Fearing the nearby towns will be affected by these poison gasses, the engineers then burned the methane gas. They thought by burned the gas will turn off the remains in it. At first they thought the fire that burns the methane gas will be extinguished within a few weeks, but they are wrong. The fire continues raging for over four decades! A Canadian explorer George Kourounis became the first person in the world, the courage to go into the fiery crater known as the 'Door to Hell'. 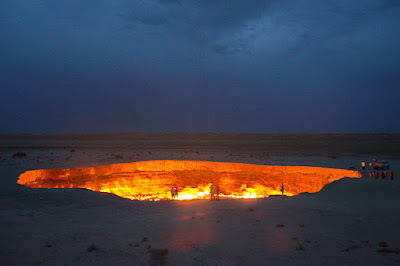 So called because the crater is located in Turkmenistan that the temperature can reach 1,000 degrees Celsius. As quoted of the Daily Mail on Sunday, May 10, 2015, using a heat-resistant clothes resemble astronauts made of aluminum, Kourounis get down to a depth of 100 feet and walk around in it. Inside the crater he collected rock samples that later revealed there was bacteria. Crater with tremendous heat that has an official name the Darvaza Crater is kept burning and never extinguished for more than 40 years. This crater remains lit until now because a drilling accident by Soviet engineers so that they were forced to burn off excess gas that comes out of the crater. Kourounis feel challenged to 'conquer' cauldron of hell after hearing the Government of Turkmenistan plans to extinguish it. He was in a crater about 15 minutes before being pulled back to the surface. "I feel in a place where humans have not been there before. As a walk on an alien planet," said Kourounis. 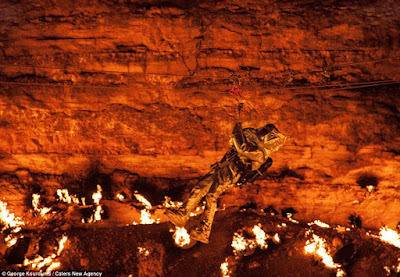 To withstand extremely high temperatures inside the crater, he wore clothing that can reflect the heat, breathing apparatus and wearing a custom Kevlar vest.